This Halloween, take your kids back in time with our Children’s Renaissance Costumes. We have a myriad of costumes for ladies in waiting and knights in shining armor. They’re guaranteed to make your kid feel like a superstar, and keep them warm! Boys will feel big and strong in our Warrior King Children’s Costume. This costume includes: Silver and Black headpiece with cowl, tunic with a dragon crest and boot tops. 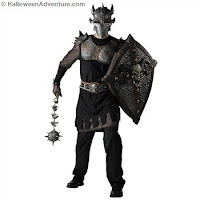 For something even bigger and better, try our Armored Knight Children’s Costume. Costume includes tunic with attached cuffs, vinyl chest piece, belt and mask. This one will remind you of the outfits donned in The Patriot, or even in Robin Hood! Our Lancelot Children’s Movie Costume takes you back in time. It’s a historical adventure in and of itself. Costume features a metallic black, silver, and red velvet shirt with hood, as well as black velvet pants. Shirt features a silver crest! Defend thy honor, O Lancelot! 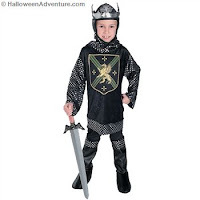 Boys will also love our King Crusader Children’s Costume. This one is bound to make him feel powerful! King Crusader includes tunic, hood with attached crown, pants, and boot tops. Tunic is red velvet and features a gold detailed crest of a lion. For more boys’ renaissance costumes, head online to our catalog at Halloween Adventures! Remember, popular costumes tend to sell out, so make sure you grab yours before someone else snags it!